Voices of the Lake is a virtual community of people with rich, personal stories about Lake Champlain, Vermont and its rivers and streams. 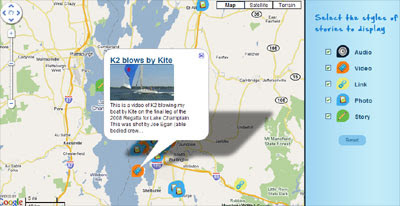 The site features a Google Map through which individuals can share their stories about Lake Champlain. Anyone can post their stories about the lake to the map. Users of the map can refine the map markers shown on the map by audio, video, links and photos. If you click on a map marker an information window opens with a link to the posted story on the Voices for the Lake website.